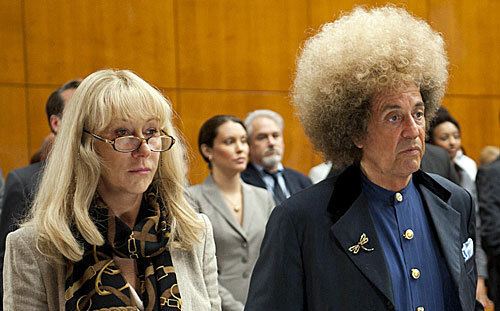 Helen Mirren as defense attorney Linda Kenney Baden and Al Pacino as Phil Spector. It seemed like a good idea on paper. 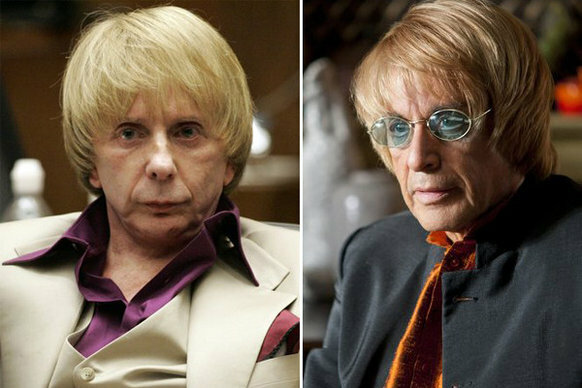 A TV movie about the Phil Spector murder trial penned by David Mamet with Al Pacino as the mercurial producer and Helen Mirren as his defense attorney. How could it miss? Well, I was a bit underwhelmed with last night’s screening of Phil Spector. I thought that Pacino did a more than credible job of channeling Spector – for once his scenery chewing worked to his advantage – and even humanizing a man who, surrounded by people and tons of stuff in his bizarre “castle,” still manages to come across as the loneliest guy in the world. Unfortunately, Mamet’s script gives Mirren little to do but look alternately tired, awed, or like Mother Confessor as Pacino’s spins his wildness. Real Phil (left) and Pacino Phil. There is a big laugh when Baden questions Spector’s bizarre choices for, um, hairpieces, Pacino bellows “A lot of people think they’re wigs. That’s called prejudice!” Also kudos to the tiny details like having well-known photos of Spector – but reshot with Pacino – appearing on posters and book covers in the set. But overall, the foregone plot just kind of limped along, reducing it to essentially a two person play with Mirren and Pacino. And just when things get good – Spector blowing up during a mock trial and Baden questioning whether to put him on the stand at all – it ends abruptly. Much has been written about Mamet’s sympathetic portrait or Spector – which has been severely criticized by Clarkson’s family – and his highlighting of the questionable evidence presented at the first trial which resulted in a mistrial due to a hung jury (just why did blood not spatter all over Spector’s jacket if he pulled the trigger on Lana Clarkson so close?) as well as the theory that Spector could not get a fair trial because people were still pissed off about the O.J Simpson verdict. Ironically, Spector’s wife Rachel has also gone on record as saying Mamet’s portrayal of her husband is not accurate either. And I’ll admit, some of the points did make me question the guilty outcome of the second trail (or at least the “beyond a reasonable doubt” bit), for which 73-year-old Spector is now behind bars in California, probably for the rest of his life. There is a telling moment toward the beginning when Baden takes the case and holds up both a 45 record and that little yellow insert that allows it to be played on a 33 stereo and asks a young law associate what the objects are. When he cannot identify them, she knows that she may as well be defending Mussolini or Genghis Khan or some other distant historical figure from the past for all the name “Phil Spector” must have meant in 2007, decades after his hitmaking days. “Being weird is not a crime” one character notes during the movie. And whether Spector’s weirdness and wigs and past helped to convict him of murder is something music and legal students will probably debate for years – though ultimately, it’s the music will outlast it all. This entry was posted in Classic Rock on TV and tagged Al Pacino, David Mamet, Helen Mirren, Phil Spector, Wall of Sound. Bookmark the permalink.